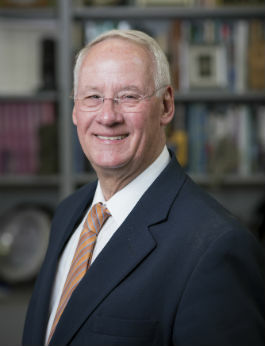 Oregon State University President Edward J. Ray today said that university leaders will work to secure state bonding to help support continued expansion of the OSU-Cascades campus and the construction of a student success center during the 2019 legislative session. Ray gave his annual OSU-Cascades State of the University address today to more than 400 people at the Riverhouse Convention Center. OSU will seek legislative bonding authorization totaling $34.5 million, including $17 million for the student success center and $17.5 million to support development costs to expand the Bend campus, Ray said. Already, students at OSU-Cascades have approved a student fee increase that over time will raise $5 million to support construction of the proposed student success center. The new funding priorities come months after the Oregon Legislature approved $39 million in state-backed bonds for OSU-Cascades’ second academic building. Ray also used his address to share an update on OSU’s 15-month commemoration of its 150th anniversary, and to urge the Oregon Legislature to prioritize higher education funding. Ray said that tuition now pays 67.3 percent of the cost of Oregon State’s educational operations, and the state only contributes 21.6 percent. This represents more than a 50 percent decline in the state’s relative contribution over the past two decades. In June the university graduated its largest class ever: 6,807 students, including 334 from OSU-Cascades. In the fall, OSU-Cascades enrolled 1,204 students, an increase of 7 percent from 2016. Ninety-two percent of those OSU-Cascades students were Oregonians, and 67 percent were from Central Oregon. In 2017 grant-funded research at Oregon State totaled a record $441 million – a 31 percent increase over 2016. Ray also recognized two faculty at OSU-Cascades, Yong Bakos and Ann Peterson. Bakos leads the computer science program and partners with local companies and organizations to allow students to gain work experience. Peterson, a biology instructor and researcher, is studying the health effects of pollution in the Deschutes, John Day and Crooked rivers. In 2017, the university reached 2.3 million Oregonians with the help of 13,000 community volunteers, and investments by the state and counties through its outreach and engagement programs. Ray cited OSU’s Juntos program, which serves more than 3,000 Latino families in 23 Oregon communities. Juntos is located in nine Central Oregon high schools and middle schools and serves more than 800 families in Bend, Redmond, Jefferson County and Crook County. Of those students participating in Juntos, 100 percent earn their high school degree and 92 percent go to a community college or four-year university or college. Oregon State’s gross economic and societal impact in 2017 totaled $2.71 billion – up $343 million from three years ago, according to a study completed by ECONorthwest. University operations were responsible for supporting 30,451 jobs statewide. OSU-Cascades is expected to contribute $134.4 million and 2,083 jobs in 2025, which is more than a threefold increase since 2015. OSU-Cascades Vice President Becky Johnson also spoke at the State of the University Address. She said that OSU-Cascades’ second academic building is critical to the success of the campus. Ray also discussed the university’s plans to expand its presence in Portland. Beginning this fall, the university will occupy the entire second floor of the historic Meier & Frank Building in downtown Portland. The space will be used to offer hybrid online graduate and undergraduate classes in business, cybersecurity, psychology, and human development and family sciences. “Serving the Portland region is part of our mission as Oregon’s statewide university and complements the work we do in Corvallis and Bend, as well as major OSU initiatives,” Ray said. He also shared an update on the university’s student success initiative that by 2020 seeks to raise first-year retention rates for all undergraduate students to 90 percent and raise six-year graduation rates for all undergraduate students to 70 percent.